I dreamt of my father and mother today. He was looking handsome. She had that calm air about her which had always been hers, as though she had made it herself. With every gaze of her sharp brown eyes, every raising and lowering of her eyelids, the slow purposeful turn of her head, the stillness she held in every line and curve. She could turn the calm into what she willed in an instant. It always impacted you with such force. A burst of laughter tossed you into a state of mirth. A flick of her eyelid sent shivers down your shin right up to the toes, the most awful anticipation of catastrophe swarming in. I asked my father if he had his camera. I wanted to take a picture of them there; that scene. It was a nice horizontal frame. And he looked so handsome. He smiled, I think. He said, or maybe he just shook his head to say, No, his camera wasn’t there. He was good with taking pictures, so good. Single lens reflex, I was thirteen when I heard those words first. I’m still not sure what they mean exactly, or maybe in a way I do know. But those words are really him to me. When I hear them I may think physics or light or real or professional or depth of field or focus but before all of that, he would come to mind. He smiled, i am sure he did. He looked happy, as if nothing could taint him. She was in the kitchen I saw as I walked up closer; bending over the floor despite her considerable girth. With swift, unerring strokes, she was drawing an alpana. Was there a special occasion? The motifs were geometrical, straight lines, flowers with many petals she etched quickly, squeezing the clump of cotton wool soaked in the paint made of pounded rice and water. The white fluid dripped on the floor. Why was she making an alpana around the tap? The kitchen was dinghy as usual, the walls streaked with charcoal smoke, almost black. The floor was plain grey concrete: cracks everywhere, the edges grown smooth over the years. I looked at her for a few long minutes. She was so sure of her drawing. I didn’t want to disturb her. It was good to see her. Everything for those long few minutes seemed all right, as it was supposed to be. Nothing had been the way it was supposed to be. And since when I couldn’t recall. But who would tell her calm that? I started walking away from the scene. It felt like mine. It felt like home… but I had to leave I knew. The picture came with me, maybe my father took it. The lotuses had many petals. She drew them with such ease. His shirt was white, his pants grey, loose as he liked it, he stood there quietly looking at me. I know she had a serene expression. She didn’t smile. I came to the tall door of the room, my eyes fell on the threshold. It stretched across; solid wood, its edges were beveled. There was a narrower piece running along the top, that familiar stepped look, the wood was worn with use, there was a hole drilled through the centre at the base. I had always wondered why, was it to let the water out? In case it rained inside the room? What an absurd thought, but you must make room for the absurd I learnt later… and the rain did fall inside, through all the holes in the ceiling, the holes no one could see but the rain drops found them anyway. I was about to cross over the threshold when the colour of the door caught my eye. Why was it brown? Wasn’t it supposed to be green? But it was brown. “Why are you here…” said someone. I looked about me, there was no one there. “Can’t see me? Or perhaps you don’t want to?” said the voice. I began to frown. Why that slightly mocking tone? Who was it? There was no one there. I walked away and went down the wide stairs with their rounded nosing and fading mosaic, toward the courtyard. At the first pillar at the top of the steps, though, I did pause for a second. I wanted to run my fingers along the smooth curve that flared out as the pillar came down to its square base. It was just something I liked to do. The courtyard was flat and grey, it sloped slightly in the direction of the pavilion with the two large wide seats made of stone. Or was it cement? The seats had a regal air. They faced each, about ten feet apart. Above them was the arched canopy of iron which once must have had something covering the framework, now there was only rust. There were no cushions, but if you sat and pushed right back to the bolster-like back rest, and flung your arms over it, leaning back, or curled up, it was surprisingly comfortable. Whoever had designed the seats knew his, or her, material; how to make it give its best. I wondered why my mother was drawing lotuses on the kitchen floor as I slid backwards and lay on the stone. were there lotuses in the pond? The pond. I’d never seen the pond. Yet it was always there, deep and filled with long green reeds at the bottom. My father learnt to swim in it. It was right here beside the pavilion. In fact, the stone seats had always been called “the sitting room by the the pond” or simply “by the pond.” So even though soon after I was born they’d filled the pond and sold the land on the advice of a wily cousin, the water still rippled across the surface, the reeds slipped around your ankles winding up; they caught your shin and pulled you right down. Houses stood where the pond once was, a road cut through and cars drove up to shining new porticoes. But nothing could drown the memory of the pond. The wily cousin bought most of the once pond land at the price of water, as they say: a nice Bengali phrase for very inexpensive. Everyone felt clever whispering this in the middle of the story they were telling about the grand past of the home, about the ascent of my grand grandfather as a highly respected lawyer, about the lineage which could be traced all the way back for fourteen generations, the sprawling fruit gardens around the house, the huge festivals, the weddings that went on for days, the royal tantrums thrown by my great grandmother if the trousseau from the new bride’s home wasn’t worthy enough: people had the grace to look embarrassed, even if mildly, about that last thing. 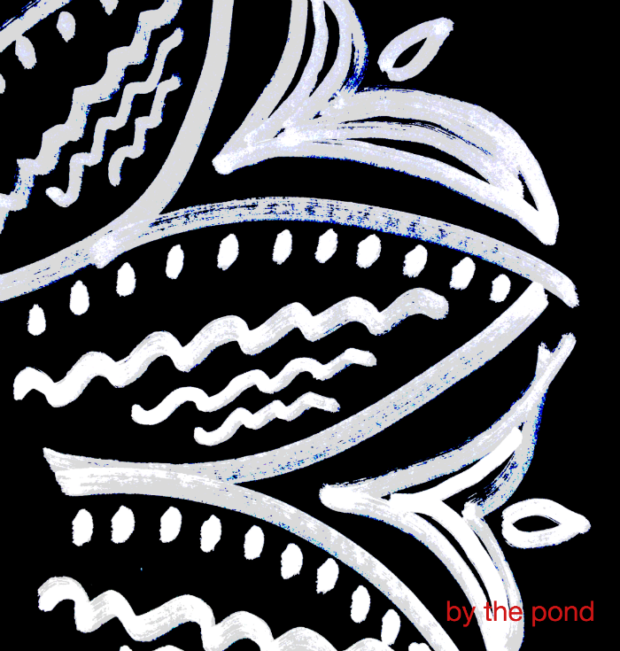 Somewhere along the way the pond came up… then the cousin, and “joler dor,” the price of water. No one spoke of the sprites that played in the pond, the ships that sailed to distant lands, the ogre with the scraggly beard, and the lotuses. I’d never seen the pond, but i knew they were all there. well, not the lotuses, maybe, but the rest. yes, they were there, and a prince and princess too… the whole neighbourhood came to take water from the pond. Clothes and utensils were washed. people bathed in it, and did other things too, I screwed up my nose at the thought. Everyone at home suffered from all sorts of stomach ailments, they drank the pond water. When it rained, the pond must have looked pretty, from the windows of the front room it would have been a lovely sight. You could sit on the ledge and watch the rain drops skip on the surface, sprites catching rain strands and swinging on them. “There was no window in the beginning, don’t you remember?” said the voice. Now i was getting used to no one being there when I looked around. “They filled the pond with earth from who knows where, I watched silently as the trucks came and the men went to work. So many times the trucks returned, and the dust all around. Dumma would grumble the whole day, and the servants would run around with their brooms. Only two of them and just look at how much they had to get cleaned up…” there was now a pensive sound to the voice. Dumma was my great aunt: the matriarch, some said, of the house. A house where a girl was not supposed to go to school after class five, because that in some way would tarnish the reputation of the family. Yet there was Dumma the matriarch. I knew the story, how the brothers then agreed to divide the place among themselves. And six homes were created out of one. even the gardens and the land all around were cut into just, sometimes unjust, shares. “I know all that,” I said testily. “To know is one thing… but to feel…” a moment’s pause. “They beat, they hammered, they cut and sawed, they slapped on unfamiliar things, the men sang at times, sometimes they spat on me. but I didn’t mind. I was growing, expanding, bigger…” said the house. In a dream, houses can talk. The sprites had cast a spell perhaps. “But the pond had to go then. The buildings came. Your father left…” was there an accusing tone there? “I know you never liked me,” the house stated calmly. I didn’t, that was true. The gloom that hung in the green walled rooms always unnerved me. What was i to do with so much gloom? Nothing seemed to displace it; not the sweets and pickles, not the toys and the tales of unearthly creatures, not the play in the sand pits near the “sitting room by the pond.” The low thick air of devastation stayed put. I waited for our annual visits to end, my spirits lifting at the thought of reaching Delhi next, my other grandparents’ home, where there was only sunshine and happiness. “And yet, you couldn’t leave me, could you?” asked the house, definitely a cocky challenge in its inflection. Not the sprites, the ogre must have given it the power of speech. The water on the surface of the pond shimmered. I closed my eyes. There was no house any more either. It had gone, almost all of it. divisions and more divisions. Then the spate of breaking and building new buildings. Apartment blocks. The era of “promoters”; the promise of new wealth to old, often impoverished, families that was too hard to demur. This time there was no wily cousin, there was no need for one. “You know there are no photographs of me, don’t you?” the house asked, I looked up at the windows, the bank of green shuttered windows in the front. The girl who wouldn’t be sent to school had a husband, he’d sat in the room just beyond the windows and spoken of ridiculous things one day, like how he used to go to his office skiing in some snowy country once upon a time. There were jinns and fey creatures in the house, that filled your head with strange imaginings. “Nothing of me is left now…” I heard the house say. I could see its roof, high above me, charcoal grey, patches of colour here and there. Curlicues, and ornaments, and moss. A pigeon flew out of the eaves. I went back to the kitchen. My father was still standing there. My mother had just finished her alpana. “Why did you never take any pictures of the house?” I asked. He smiled faintly. That smile i knew so well. I reached out to touch it, the white paint flowed, it’s a dream. I told myself, it’s a dream. The ships got ready to sail, the prince smiled, the princess’s eyelids flickered, the reeds came up and pulled me down. an old house talks to me often. i write. sometimes the stories are happy, sometimes not. sometimes they’re not exactly stories. i do hope reading this one gave you something. i wonder if a writer and a reader can touch the same feelings. even if not, something of yours do take away from here.